(12' Box with 8' Porch) with appliances and huge smoker for a pretty good price. Any information world be greatly appreciated. Went through Trailer Country for my trailer. It was finished out in Waycross. Waycross is not very big, so I bet it was done by that bunch. They did a alright job. can't see where you are from, but hope you don't have to drive across Hot Lanta pulling that trailer to get home. That drive is a beeyatch! Thanks for the reply FreebirdTPark. I have attached a link for the trailer if you want to take a look. I use to do uShip hauls and had to drive through ATL a couple of times. It can get crazy. But my enclosed trailer was only a 7X14ft trailer. I'm pretty sure a 8.5X20ft trailer is another animal. Bought my newest rig from them, picked it up right before thanksgiving. George was VERY good to deal with, Tracey [ one of the owners ] was awesome to work with on my custom design. I had them install walls and sink package. Also had them custom build the frame, window opening and some other touches I have learned over the past 6 years. I finished the inside myself [ 3rd one in 8 years ] I personally would HIGHLY recommend them to anyone! !Is every sq. inch perfect, nope...Is it an awesome rig overall?? I thing so!! I also took some time to look over the smoker they show on this rig, talked with the guy who designed it. It has some great features, and a couple I personally would change - but you will find that with any smoker! As far as driving through hotlanta...I will say they have MUCH better drivers than Nashville!! More in Ga, yes, but fewer IDIOTS on the road as I pulled my 28' w/v-nose home! Thanks for the reply Mr. Tony. That is a nice rig you have purchased. Like I have mentioned on previous post I plan on doing the BBQ vending gig after I retire. I am shooting for a used rig but I wouldn't mind paying a little more to get exactly what I want. 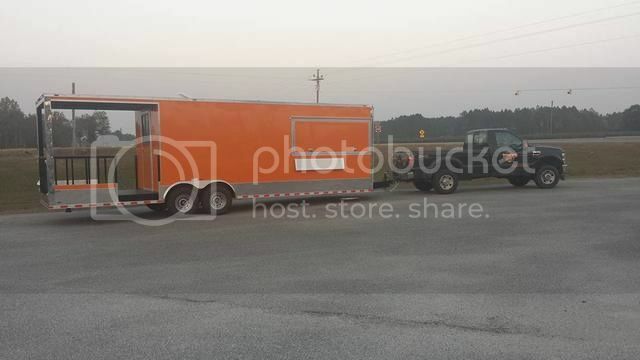 I just picked my trailer up from SDG last weekend. The trailer is very well built. The guys were knowledgeable and were good to deal with. There prices were comparable to others places. They are very busy and sometimes hard to get ahold of, but they put out a quality product.